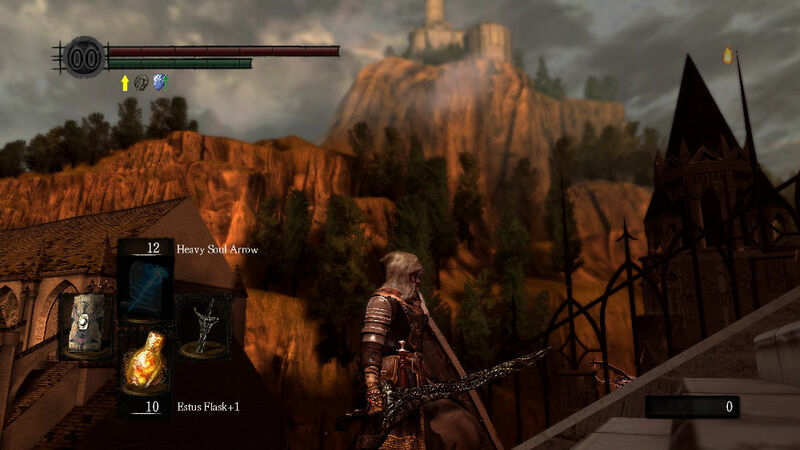 There is really no shortage of stunning vistas in Dark Souls, and it’s something that FROM were clearly aware of in the course of development given the potential to leave Orange Soapstone messages that point out of pulchritude of the scenery of Lordran. The first visit to Anor Londo and the descent down the myriad of sets of stairs is an exercise in making the player look at the effort that has gone into designing a world that is at once beautiful and utterly fucked. That is the true artistry of the game: while the game is not explicitly linear, it does a wonderful job through visual, auditory and gameplay cues directing the player in the right direction. This is the sort of implicit communication that the design of the game rewards the player for picking up upon, not just in gameplay itself but also in understanding the game’s complex lore. The beauty of Anor Londo, however, is wonderful misdirection: it hosts two of the game’s more questionable platforming experiences and the first instance in which previous boss enemies are presented as normal foes. Get distracted by the beauty of a building’s interior while crossing girders near the ceiling? That’s you going back to a bonfire. Take a look at a stunning landscape while walking across a roof? That’s a train-sized arrow in your side, if you’re lucky enough not to knocked off the narrow platform. Again, that beauty/terror dichotomy is worked to the bone in gameplay as well: if you want to progress, you’re going to have to deal with some tough enemies on an incredibly narrow platform. While much is made of the archers on these platforms, I was fortunate enough to manage to push them to their deaths using a shield in two hands. That said, anticlimax was preventing by knowing that I’d been clever enough to work out a solution to what was a problem area for many people. I appreciate that the Lordran is going through some changes of sorts, but considering the worth of the Bells of Awakening and the souls of the bosses within the areas, but you’d think that more care and attention may be paid to physical security of buildings rather than the approach of “just put a mix of different sorts of people outside, it’ll be fine” that has clearly been taken here. With the number of broken windows and open doors on the exterior of the cathedral that makes up much of Anor Londo, there’s no way that this place would pass an ISO27001 audit. That said, once in the building, there’s a fair amount of strife to be had from the Silver Knights who are lurking around. While indicative of the way that enemies from this point on will tends towards the tougher side of things, it takes a while to adapt to these enemies the likes of which have only been found in out-of-the-way areas previously – a further expression of the game’s ethos of “think you can deal with this now? Well, how about this?” This constant challenging of what the player believes to be true about the game and its world is testament to its mechanics being compelling to the point of obsession. All is permanently in flux while the first principles of play remain the same. 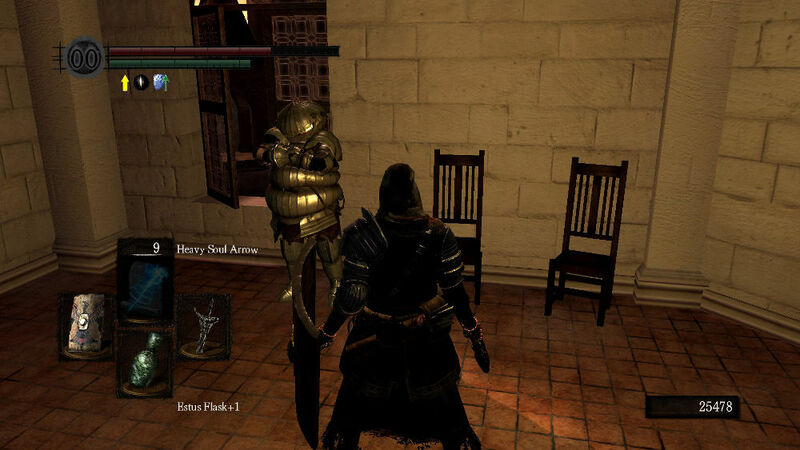 Siegmeyer makes another welcome appearance in Anor Londo. Having explored the cathedral as fully as I could, coming across the blacksmith and opening up the shortcut into the building that would avoid the acrobatics necessary for the conventional drop-in entrance, I did my best to run past the giants in the main hallway and run to the boss fight with Orstein and Smough: it was the fight with the Capra Demon all over again. 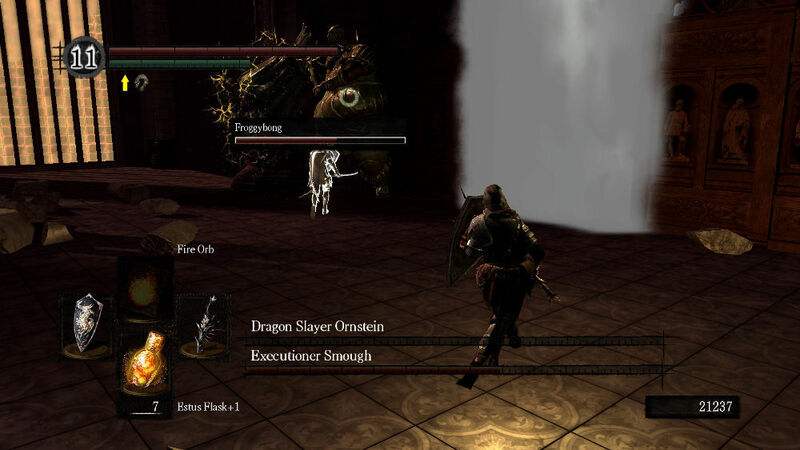 Either of the two taken on their own would not have been too difficult a fight, but having to deal with both simultaneously, particularly with Ornstein being so quick to move around the arena, was beyond a reasonable request. Five tries later, I had decided that it was not an issue of skill that was holding me back, but rather my gear and my level. Playing grindfest JRPGs in my youth probably didn’t help in this conclusion being drawn. I think it should be stressed that Dark Souls is a game that can be played in a number of ways: the popularity of no-shield and Soul Level 1 runthroughs is testament to this. The game is mechanically sound enough that any approach to play, with sufficient player skill, will be rewarded with success. With that in mind, and with the assertion that the game was designed to be so versatile, I don’t think that grinding is necessary a bad approach to things. Post-hoc rationalisations dealt with, I headed back to Blacksmith Andrei to upgrade a Falchion to +10 so that I would be able to have the giant blacksmith in Anor Londo create Quelaag’s Furysword for me. A giant flaming sword should surely lead to more success. In addition to this, I headed to the Depths to form humanity from the rats down there, as well as farming large titanite shards from the slimes down there. The wonderful thing about using the Covetous Gold Serpent Ring to collect humanity is that use of that humanity scales the likelihood of finding more humanity by a fair amount as well. Discovery is rewarded with more discovery. Dark Souls really encourages jolly cooperation of the sort that would make Solaire gleeful. Heading back to Anor Londo, I had decided that I would go all out on this attempt to defeat Ornstein and Smough: in the ultimate Dark Souls dangerwank, I consumed the majority of my humanity, reversed my hollowing and summoned a friendly player to see if they would be able to get me through the battle when coupled with the scaled fire damage from the Chaos Witch’s sword. Thanks to this kind individual tanking Smough while I dealt with Ornstein, light work was made of something that probably would have held me up for some time. Froggybong of GWFL, I salute you. Heading up the stairs, I met Gwynevere and obtained the Lordvessel. Finally, some thirty hours into my playthrough, I had obtained the ability to fast travel. Praise the Sun. PC Ports: Irredeemable, inevitable failures?